This week’s letter for Frizztext’s A-Z archive photo challenge is S. We spied this lion in the Okavango Delta. 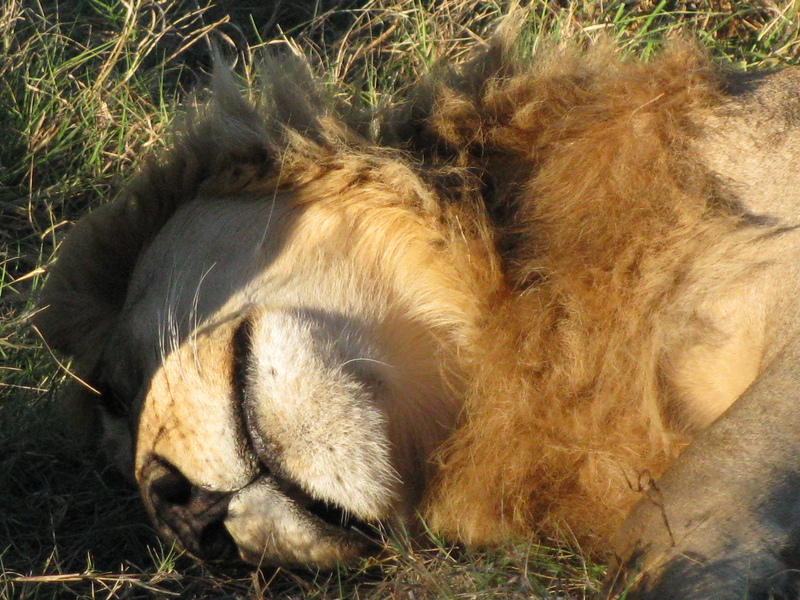 Even though there was a jeep full of people snapping photos this lion didn’t seem to mind and continued snoozing. For other photo entries please visit this page. This entry was posted in Africa, Travel Photos and tagged A-Z Archive, Africa, Botswana, Life, Lions, Okavango Delta, Photography, Photos, Travel, Travel Photos, Wildlife. Bookmark the permalink. I think that would be a different entry for S is for suicide so I resisted cuddling. I wonder how long it would take him to take care of me to continue his nap. Amazing creatures. And who would dare interrupt his nap? Not I…bravery is not really in my vocab when dealing with nature. It has to get annoying. LOL…I’m sure I would be on the losing end. He looks adorable but I suspect if he was awake he would have been a little less adorable!!! Great picture! Can’t wait to take some like that of my own…someday! I hope you do and take lots of photos to share with us! I like your blog so much, I nominated you for the Versatile Blogger Award. Thanks so much for the nomination. And congrats to you! I’m sure he’ll be back after his nap. I wouldn’t want to find out. Awww. Can a lion be adorable? I think so…as long as they aren’t attacking. I saw his “breakfast” the next day and he wasn’t so sweet after we left. I wish I could sleep like that and look cute. How close did you get to this sleeping beauty? Wow! Pretty close actually, but we were in a jeep and staying extremely quiet. Great shot of the sleeping lion! That’s when they are the most gentle looking. When you see a lion like this you almost forget that they are predators…almost. He looks like he’s just waiting for someone to come along and ruffle his mane. He does make sleeping look so enticing. Thanks…I wish I could sleep like this after a big meal.